On Saturday, March 24th, 2018, Tim, Josh, Vern, Allen, and Andrew flew to Kauai to join Rotarians from the Rotary Club of West Kauai and Kokee Resource Conservative Program to plant native trees and plants in Kokee (Waimea Canyon). 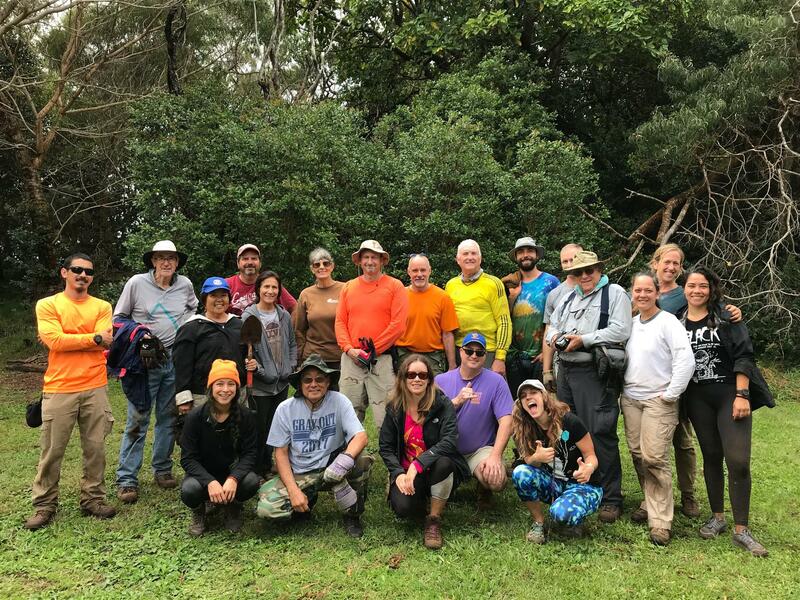 Hosted by Trout Unlimited member, Deane Gonzalez, they were able to plant nineteen native plants, including Koa, Naupaka, Ukiuki, Maile, A`ali`i, Ohia, Loulu, Uki, Kokio Keokeo, and Pilo, as well as treated a total of 1,436 invasive weeds. KRCP is a volunteer based alien species control program sponsored by the Garden Island Resource Conservation & Development, Inc. in collaboration with the Hawaiʻi Department of Land & Natural Resources (DLNR) State Parks Division and Division of Forestry and Wildlife (DOFAW). KRCP involves the public in protecting native ecosystem resources, coordinating volunteers to conduct essential invasive noxious weed removal in selected areas. KRCP has been highly successful and popular since it was officially started in January 1998. As of September 2013 over 27,000 volunteers, including repeat volunteers, have contributed 137,731 hours of labor. Weed control was initiated in 9,765 acres (includes repeat acres) of the Parks and Forest Reserves. Populations of several incipient invaders were greatly reduced, and a total of 10,095,236 individual non-native plants removed. Weeding and other management activities were conducted n the vicinity of fourteen different species of Threatened and Endangered plants. Preserving the biodiversity of this unique region will only be realized by keeping pressure on the invasive species. The natural resources of Hawaiʻi contain magnificent ecosystems that are unique in the world, and need protection immediately. KRCP is addressing these concerns with work on the ground to preserve these upland forests and involve the community in resource conservation.